Adding to the challenge, the bureau was completely unequipped. There were no work stations, no seismic processing or interpretation software and no budget to purchase these essential tools. Thanks to Hardage’s hard work, what started as a scrappy seismic research operation is now a hub for leading-edge geophysics research. The bureau has more than 150 software licenses for seismic research, 12 research geophysicists, approximately 20 graduate students doing seismic-related research, and more than 400 computers where scientists can conduct the analysis required for reservoir characterization. Now retired as of January 2018, Hardage played an instrumental part in building the bureau’s seismic capabilities and exposing industry — particularly small, independent operators — to 3-D seismic techniques. His career is inextricably linked with the growth and success of the bureau as a powerhouse for seismic processing research and expertise. Hardage spent 25 years in industry before joining the bureau in 1991. Most of his industry experience was at Phillips 66, where he worked after earning his bachelor’s, master’s and doctoral degrees in physics from Oklahoma State University. He worked his way to becoming exploration manager of Asia and Latin America, making him responsible for half of Phillips’ international exploration. But after an ongoing series of company upheavals, he decided to try a quieter life in a university setting. He immediately got to work collecting the hardware required for building a seismic research hub at the bureau. 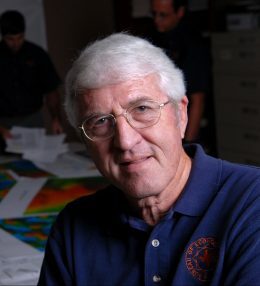 IBM donated a workstation and former SEG president, and Hardage’s friend, Robert Graebner donated the first 3-D seismic interpretation software license. These gifts allowed the bureau to start on the first of several in-house, 3-D seismic characterizations of gas reservoirs for a U.S. Department of Energy program called Secondary Gas Recovery. By the early 1990s, Hardage persuaded Landmark, the then-dominant developer of 3-D seismic interpretation software, to donate several more software licenses to the bureau. Hardage remembers some good-natured teasing about his persistence from Landmark’s then-president John Gibson. Hardage recalls approaching Gibson and other Landmark executives at an SEG meeting to thank them for providing licenses. Gibson later served years on the bureau’s Advisory Committee and has been a valuable bureau supporter and advisor. Hardage also acquired a full seismic test field for the bureau. The 100-acre Devine Test Site on the southern border of Medina County was gifted by BP to the bureau for public research, and is known worldwide as a research site for many U.S. and international companies, particularly for boreholerelated technology. The bureau released the first 3-D survey that it designed, acquired, processed and interpreted (called the Stratton survey) as a public data set in 1994 to assist the transfer of 3-D seismic technology to the global geoscience community. The release of the data coincided with efforts by several entrepreneurs to develop 3-D seismic-interpretation technology. Hardage assisted with connecting business owners to the Stratton data processed by the bureau. This exchange helped the bureau build a reputation as a resource for small geophysics software companies and a key player in applying 3-D seismic technology in reservoir characterization. Along with building the bureau’s own technology and partnerships, Hardage helped spread the word about 3-D seismic to the public via workshops and lecture tours. He remembers how a particular workshop in Graham, Texas, caused a stir among operators who had been exploring for gas reservoirs using only 2-D seismic. They were amazed how the 3-D seismic showed evidence of Ellenburger karst collapse features, which caused compartmentalization of gas reservoirs in the shallower Boonsville interval. The workshop inspired Hardage to develop a larger-scale, short-course series for independent operators. The series was presented in Texas, New Mexico, Louisiana, Oklahoma and Kansas, and later adapted for an international tour, presented with Landmark, that covered four continents. 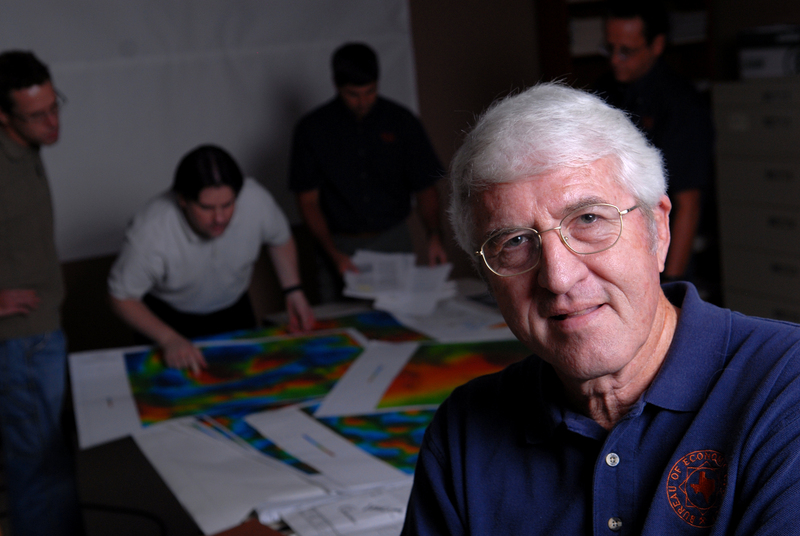 The short-course workshops were the first exposure that some operators had to 3-D seismic technology, and as a result ofthe six-month tour, Hardage received a special commendation from SEG in 1998 for transferring 3-D seismic technology to small independents. Hardage’s efforts in collecting technology, building connections and spreading the word about 3-D seismic innovations has paid off for the bureau, which now has a seismic research capability that Hardage calls remarkable. In 2012, the Jackson School as a whole recognized his accomplishments by awarding Hardage the school’s Outstanding Service Award. Reflecting on the decades-long task, Hardage said that he is proud to have guided the process. “I have good memories of helping the bureau undergo the transition from near-zero capability in geophysics to its present state of being at the cutting-edge of 3-D seismic reflection technology,” he said.